Browse: Home /	Bicycling, Events / Brooklyn looks best from a bike! 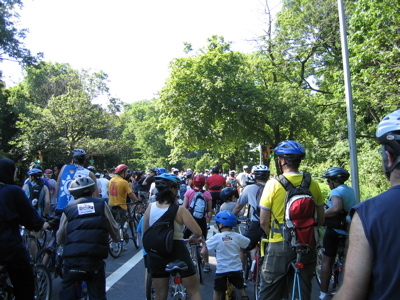 Tour de Brooklyn 2007 is this Sunday! This year’s route includes Park Slope, Green-Wood Cemetery, Sunset Park (highest elevation in Brooklyn, great view of the harbor! ), Bay Ridge, Verrazano Bridge, Dyker Beach Park, Bensonhurst Park, Drier Offerman Park, Kensington, Prospect Park South… and ends at the Prospect Park Carousel. Worth getting up absurdly early on a Sunday! Registration (it’s free!) and other info here. I miss this event every year because of some conflict. This year I will miss it because of the Japan Day Race. Maybe next year. When is the Tour de Bronx? i think tour de bronx is in october. that’s the one i always miss, but hopefully not this year! Tour de Brooklyn baby! It’s the bomb! So is the TdBronx, best rides of the year, don’t miss….